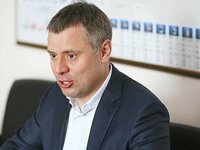 National joint-stock company Naftogaz Ukrainy believes that the extension of the gas transit contract with Russia's Gazprom on the current conditions is not advisable, it does not have any guarantees for the volumes of gas transit, Naftogaz Chief Commercial Officer (CCO) Yuriy Vitrenko has said. "In addition to its inconsistency with European rules, interpreted by Gazprom this contract does not contain any guarantees on the volume of transit, that is, after the construction of Nord Stream 2, Gazprom will be able to reduce transit through Ukraine to nil, even if the contract is renewed for future years," he wrote on his Facebook page. Vitrenko recalled that the current contract does not contain a "take or pay" condition and Ukraine had to seek compensation for the damage through arbitration due to annual pumping being less than 110 billion cubic meters. "However, Gazprom is against this interpretation of the contract. In their interpretation, they pay only for the volume pumped," he said. As reported, Gazprom in the course of the tripartite talks held on January 21 proposed to extend the existing contracts with Naftogaz. Ukraine is ready to sign a transit agreement in accordance with the European rules, which the country implements into the Ukrainian gas legislation.